Properties in Kjarvalsstadir average 4.4 out of 5 stars. Spacious newly apartment - Free WiFi and parking garage. Satellite TV. Property 1: Spacious newly apartment - Free WiFi and parking garage. Satellite TV. Felicia's Flat, Downtown Reykjavik, Great location near Hallgrimskirkja. 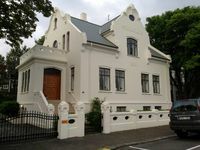 Property 4: Felicia's Flat, Downtown Reykjavik, Great location near Hallgrimskirkja. Studio 11 private little house. Property 13: Studio 11 private little house. Bright and modern - centrally located apartment with separate entrance. Property 20: Bright and modern - centrally located apartment with separate entrance. Cosy apartment by the south beach in 101 Reykjavík. Property 22: Cosy apartment by the south beach in 101 Reykjavík. Cozy Apartment In Lava Surroundings, a hidden gem! Property 27: Cozy Apartment In Lava Surroundings, a hidden gem! Reykjavik centre flat for 6 guests. Property 32: Reykjavik centre flat for 6 guests. We spent our first couple of nights in Iceland here, and we absolutely loved it! Bjorn was a wonderful host and was extremely helpful. The apartment has every comfort you could possibly need, including a full kitchen. We really liked being able to park our rental car in the garage for our stay and explore the city on foot. The location was convenient to most of the places we wanted to go, and there are plenty of nearby restaurants. The deck had a great view that we enjoyed even though it was still snowing when we were there. We had such a great stay here and would highly recommend this apartment and our host! This apartment is big, beautiful and well appointed. The location is terrific, near shopping grocery stores and bus lines. We came with two adult children and spouse, and two grandchildren 2 and 10. 2 bathrooms, lots of room for all, and a backyard. We thank Pall and his wife for their kindness and consideration in all things.